Draw an object (let's say a rectangle) and keep it selected. Select the Pick Tool. If you have deselected the object you have to click on it to select it again. Now click again on the object and observe the difference. The selection points are turned into direction arrows. 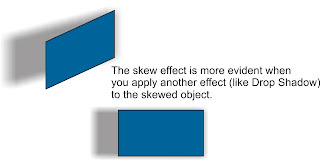 The Skew arrows are in the middle of the four lines of the rectangle. Place the cursor near one of the direction arrows. The cursor's shape changes into a double straight line arrows. Now, place the cursor on the mid-point of one of the horizontal lines of the object and drag to the left or to the right. The object will be skewed horizontally. Hold down the Ctrl key if you want to skew the object in 15-degree increments. Place the cursor on the mid-point of one of the vertical lines of the object and drag up or down. The object will be skewed vertically. Hold down the Ctrl key if you want to skew the object in 15-degree increments. If you want to observe more clearly the skewing effect you can apply another effect (like Drop Shadow) to the skewed object.